White Peach and Silk Blossoms TYPE Solid Perfume, Perfume, Perfume Balm, Solid Fragrance, Natural, Handmade. Compare to Caress Daily Silk with White Peach & Silk Blossom. White Peach and Silk Blossoms is an elegant, upscale fragrance. It is a beautiful arrangement of sophisticated florals including peony petals, muguet lily and silk flowers (mimosa flowers), floral sandalwood and floral musk with top notes of fresh peach, mandarin, and neroli blossoms. This White Peach and Silk Blossoms fragrance is similar to Caress daily silkening fragrance. This is a wonderful new fragrance that is absolutely one of my newest favorites! It is soft and elegant! 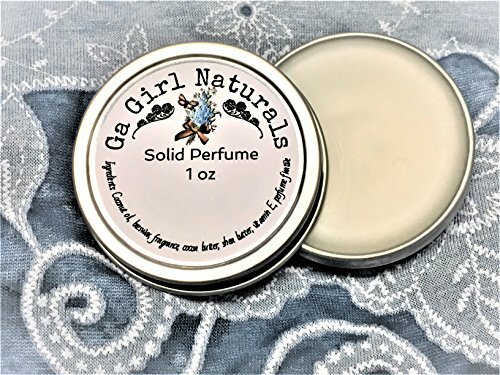 My handmade solid perfume is highly scented and long lasting, as well as moisturizing! Made with coconut oil, beeswax, phthalate free fragrance oil, organic cocoa butter, organic shea butter, tocopherol vitamin e These come in a 1 ounce tin. They are very convenient to carry with you anywhere. They also may great gifts! All the fragrance oils I use in my products are phthalate free (non-toxic). Phthalate free Propylene glycol free Paraben free Gluten free Cruelty free My credentials: I have a Master Cosmetology license and a certificate in Natural Health and Healing. If you have any questions about this product by GA Girl Naturals, contact us by completing and submitting the form below. If you are looking for a specif part number, please include it with your message.